Until 12,000 years ago, the native faunas on the islands of the Mediterranean were very different than they are now. They included pony-sized elephants, pig-sized hippos, dwarf gorals with continuously-growing teeth like those of rodents (Myotragus balearicus of Mallorca), dwarf deer with simplified antlers that are longer than their bodies (Candiacervus of Crete), giant rabbits (Nuralagus rex of Menorca) and giant dormice (Leithaia of Sicily and Malta). Those were the days of dwarfs and giants. The smallest elephant that ever roamed the Earth lived on Sicily (Palaeoloxodon falconeri). It had a shoulder height of about one meter and a mere 2-4% of the body mass of its mainland ancestor (Palaeoloxodon antiquus), one of the largest elephants to have roamed the Earth. The smallest hippo on record is from Cyprus (Hippopotamus minor), which had dwarfed to 4% of its ancestral size. The largest mouse (Kritimys catreus) was native to Crete. It was at least eight times the size of its ancestor and would today be mistaken for a large rat. The giant dormouse of Sicily (Leithia melitensis) was up to almost fourteen times as heavy as its ancestor. These dwarfs and giants were the norm, rather than exceptions. Once isolated on an island, large mammal species evolve dwarf sizes and small mammal species evolve giant sizes. The pattern is so consistent that ecologists call it the 'island rule'. Food limitation appears to be an obvious factor. The absence of predators is also an essential factor. Absence of competition has perhaps the greatest effect. With no competitors animals are free to occupy new ecological niches that are appropriate for different body sizes and lifestyles. Extinct dwarf and giant animal forms have been unearthed on practically all islands around the world, and the Mediterranean islands are no exception. 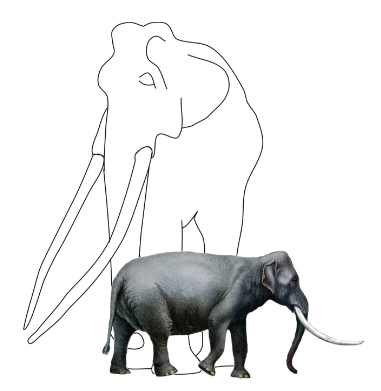 Dwarf elephants in particular had extremely wide distributions in both time and space. They are known from about thirty islands, ranging from the Californian Channel Islands (Mammuthus exilis) in the west to Timor (Stegodon timorensis) in the east. The dwarf elephant of the Greek island of Tilos (Palaeoloxodon tiliensis) may well have continued to exist into the Holocene and protohistoric age. See here. The Aetokremnos site on Crete is known for its rich fossil deposit containing many thousands of hippo bones from the Cyprus dwarf hippo (Hippopotamus minor), apparently in association with artifacts from Palaeolithic people.